Okay, people! Here at last is AKH’s own guest post. I had no idea how The Touchstone Trilogy actually came to be written, and I bet you didn’t either. Check it out! The received wisdom about becoming an author is that you have to be tough. A thick skin, some judicious padding, a solid suit of iron and perhaps even a mirrored shield. Expect rejection, and don’t read your reviews. I say reviews are one of the best things about being an author. Yes, there are negative reviews. There are also handy little stars that make them easy to avoid, or to read only after deciding you feel the need for a ‘learning experience’. Your mileage might vary on the worth of learning experiences, since the one consistent thing reviews have told me is that every reader is unique, and the exact same passage in a story can be complete dreck, or the shining jewel that a reader hoards in the deepest part of their heart, to take out and clutch when Measures are needed to get through the day. There was a time when I was completely unread. I don’t mean unpublished, I mean I wrote but showed my books to no-one. Not beta readers, not friends, not the slush pile. That was a withdrawal born of too long on the submission-go-round. Feeling like I was beating my head against a wall, I stopped giving my books even to the people who wanted to read them. I almost stopped writing altogether. I cured myself with a fiction blog, something I would write for exactly one year, putting up regular entries, but where I felt I could forget “good writing” and just say whatever I liked, because I was writing entirely for me, even if it was possible for the whole world to see. Fallen out of the World had one regular reader. I called them “New Jersey”, since their IP was the only thing I knew about them. I was enjoying writing my fiction blog, and I expect I would have kept on for the year without New Jersey, but boy did they make a difference! Each day I’d put up a blog entry, and each day New Jersey would show up and read it and I would imagine their reaction, and wonder if this entry would be enough to keep their attention, and make them want to come back tomorrow. New Jersey did give up eventually, but after the year was over, and I was only posting the occasional frothy monthly updates about weddings. And the mere fact that for an entire year I had kept the attention of a complete stranger, who knew absolutely nothing of me except the words appearing on the internet, was a lovely warm weight on the positive side of the writing scale. And that fiction blog went on to become Touchstone, and every week it brings me fresh joys. When I create a world, and people, and give them a story, they exist only to me – and the stories give me great enjoyment. When those stories open to readers, and readers write about their favourite moments, and who they ship, and the bits they didn’t like, and the bits they love, and the moments they go NO! and the other moments they go YES!, that enjoyment is magnified and reflected back a thousand fold. I love reading reviews. I particularly love reading the status updates people make on my books on Goodreads, especially when they react to THAT moment at 80% in And All the Stars (*evil grin*). Reviews, and the discussion of people who have become my audience, is the up-draft that keeps me sailing across the first draft ocean, because now when I write I’m looking forward not to the submission grind, but to how MY readers will react to THAT scene, and if they will love THIS couple, and how many will spot the clever thing behind the mystery, or be as delighted-revolted as I am by the scene with the hand. And it’s scary as well, of course, because I don’t want to let people down, but that is merely a spur to be better, so I can keep on enjoying what has become a shared adventure. 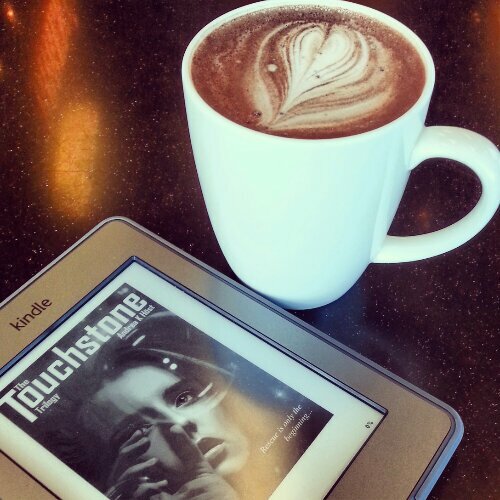 So, did anybody of you guess that Touchstone was written basically one day at a time? I expect there was some Continuity Cleanup later, but still, wow. I believe Sorcery and Cecilia was written as a letter game between Patricia Wrede and Caroline Stevermer, but I don’t offhand know of any other books written like that, though no doubt there are some. I bet few work out as well. I can certainly say I absolutely agree about reviews and about the value of the little stars. I personally have never wanted a Learning Experience enough to deliberately read a negative review. Positive reviews have enough of those little moments, not to mention that it’s so true that the same character or scene is perceived so differently by different readers that there’s no way to sort out Stuff You Did Right — everything is right for some people, and all wrong for other people. So you write for yourself and for your fans. And believe me, you cherish every. single. fan. who lets you know that he or she loved one of your books. Thank you all for participating this week. I enjoyed it, I hope all of you did, and a big after-the-fact Thank You to New Jersey, for giving Andrea the oomph to keep going through a tough time, thus making this week possible for us all. Okay, here we go, as promised, Sherwood Smith’s guest post! This one offers some historical perspective about self-publishing, which you will not find surprising if you follow her reviews on Goodreads — lots of history there, too. It’s particularly valuable to be reminded about this aspect of publishing today, when we’re undergoing such a paradigm shift in publishing and it’s still far from clear where we’ll be in five years, much less ten. Since records have been kept, it appears that artists, musicians, and writers were pretty much in charge of marketing their own work. There were no publishing conglomerates. The market was mostly confined to kings, church leaders, and universities until the Enlightenment printing boom, which was, I suspect, roughly the equivalent to the digital revolution. To get some perspective on self-publishing I think it is worthwhile to remember that to get your work in print in the west during the late 1600s to 1700s, you either fronted the cash on your own or took up a subscription, found a print shop or a bookseller, put up some broadsides, and out it went to either success or failure. Jane Austen’s first bookseller sat on her first novel without bothering to print it, and so her brother had to go to the trouble of getting it back while she tried more successfully with a second. Then came the nineteenth century, when publishing coalesced into publishing houses, with editors hired as gatekeepers. The subscription publishing model all but vanished. By the twentieth century, self-publication had pretty much dropped away to amateur status: it was so much easier to send your piece in, get an advance, and let the publishing houses handle production and marketing than to muscle your way through the complicated process of print, then the tougher prospect of getting it before the public eye. The publication process is now even easier than those wild days of the mid-eighteenth century, and as for marketing, there is the Internet! And so millions of people are doing it. I believe that ranting about the various ills of conglomerate publishing (publishing has been through such a metamorphosis over the past 200 years that the word ‘traditional’ really seems to mean ‘as has been the practice for the past fifty years’) might make one feel better for a few minutes, but otherwise isn’t going to change what people read or how they read it. These lovely, golden days, there are now nearly a million new books a year, pretty much guaranteeing that no matter how esoteric one’s tastes, there is surely something out there to fit that taste, but the real problem is finding it. I think the trustiest way to get the word out is by word-of-mouth. And that means enthusiastic readers. A writer can bombard every social medium with constant pleas, promises, and exhortations to Read My Book, or a publishing house can hurl an enormous, expensive publicity campaign at those same media, but if readers don’t read the books and talk about them, all that effort is just more noise scrolling off into infinity. Word-of-mouth puts the power of publicity into the hands of readers—and many of us are getting into the habit of tuning out the media bombardment and gleaning our recommendations from friends or online acquaintances whose tastes match ours. How many find their TBR piles growing exponentially every Wednesday because of the Reading Wednesday posts all over the Net? 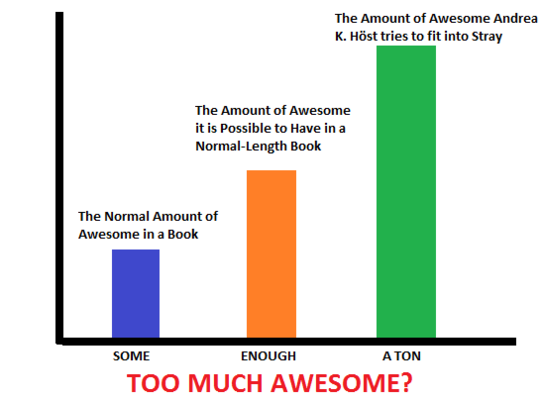 So with that thought in mind, I decided when Rachel Neumeier asked me if I wanted to do this guest blog, I should talk about why Andrea K. Höst has become one of my favorite new discoveries. Many of Höst’s novels began with a lone female tossed into a tough situation. Until I started reading her books, I hadn’t thought consciously about how frequently this works as an immediate hook for me. 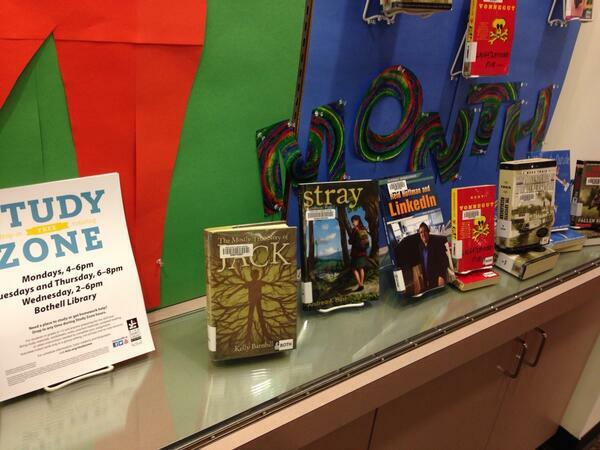 My first encounter with Höst’s books resulted from an online friend, Estara Swanberg, recommending Stray to me. While Estara’s and my tastes don’t always overlap, I was sufficiently curious to grab the first one at the very same time that she – certain that I was going to fall in love — bought me a copy of The Touchstone Trilogy at Smashwords and sent it to me. I was dubious at first, because I am not usually fond of the survival story a la Robinson Crusoe. Stray opens with a high school girl suddenly finding herself completely alone in a strange environment. One summer night, I thought I’d read a few pages before falling asleep, and the next thing I knew most of the night was gone — dawn was like two hours off — and I could not stop turning those pages. It was Cass’s voice that grabbed me instantly. I had to explore the environment with her, and her internal voice was so much fun that I found her good company while at the same time I was growing anxious over her survival. And when other humans show up, the second stage rocket took off: they, and their world, were fascinating, seen through Cass’s eyes. Though Höst’s novels often begin with a similar setup (female cast directly into some kind of conflict) none of the characters, or books, repeat a similar trajectory. One heroine is alone and tries to find people; a second is on the run away from people; a third has to resort to disguise. Another discovers that she is now a kingdom champion, and she has never touched a weapon. And the next is a powerful mage forced to go home, though it nearly kills her every dawn. Her heroines are not interchangeable. I cannot imagine Medair from her eponymous series trading places with Madeleine in And All the Stars. Or Gentian from Bones of the Fair and Cassandra from Stray doing well in each other’s circumstances. Are there some constants? Most of her heroines find romance. Höst’s romances are a pleasure to read because whatever type of relationship occurs, each partner has stuff to bring to the table, and the character negotiation is a great part of the fun. The way Höst’s characters negotiate the relationship road I think demonstrates the influence of Jane Austen; in Pride and Prejudice, the powerful man had to improve himself before the woman found him acceptable. Austen was the first to make it plain in her fiction that how women see the world matters. The books I enjoy most—that I keep on my reread shelves—are a direct descendant of Austen’s narrative through the female gaze. In Höst’s books, the female gaze is important. Her characters are complex individuals who hit the ground running and not only grow through their experiences, but have a profound impact on their world. And this trope is one of the reasons why I read fiction in the first place, what I think of as the seduction of competence. I love smart characters, and I love world building that makes me not only imagine different paradigms, but whose details permit me to see, hear, taste, touch, and smell the environments. I am amazed at how many different worlds Höst creates — I who struggles with two or three. The Touchstone Trilogy: Let’s face it, a lot of us of whatever age still like to read about People with Powers. In this trilogy, Höst does it right— with every gain, there is a commensurate cost, which keeps the tension line taut. And All the Stars: Another of my favorite tropes is the twist that changes everything, pulling me back to the beginning to reread what has become a different book. 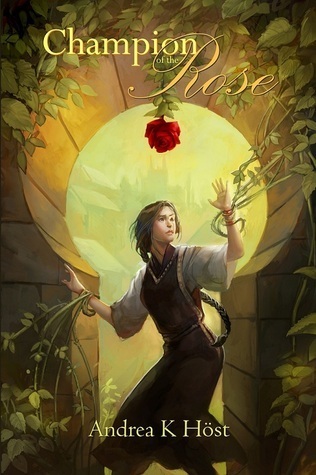 Champion of the Rose: This takes place in my favorite of Höst’s worlds, Darest. Medair: outside of Lord of the Rings, , I don’t recollect much fantasy that conveys that same sense of what the Germans call Sehnsucht, that strong sense of one’s world fading with the inexorable beauty of a long summer’s night. She explores changing cultures and the cost to the and individual in unexpected ways, while examining the tension between melancholy and hope, love and honor. There you go, and now I’m curious: which is YOUR favorite of Höst’s worlds? Mine is not Darest; too many curses! Dangerous weird inexplicable neighbors! From a live-in-it standpoint, I guess despite the lack of privacy I might pick Taren — or better, Muina. From a cool-to-tell-stories-about angle, um, that’s more difficult. Tomorrow! Andrea’s OWN guest post, so be sure to check back in! d) I really want to put Andrea’s own post up dead last, which means after Sherwood Smith’s, which means not today. So a little tour rather than an actual post, and check back in tomorrow! For Sherwood Smith’s post! And the Tuesday will wind up our AKH Week Extended Edition, but what’s an extra couple of days among friends, right? AKH’s own website, where she has a new post up about hyperaggressive characters, btw. AKH’s complete bibliography — now’s the time to decide which of these you would like if you win the giveaway! AKH’s explanation for why she started self-publishing. I have a pretty good guess about the real name of the culprit, because a certain publisher does have this reputation, but even for them — actually, for ANYONE — this is unbelievable. Let’s all raise a toast to the improved viability of self-publishing, shall we, since it would sure have been a shame to lose AKH’s stories to the kind of ridiculous foot-dragging Andrea describes in the link. Andrea’s long list of (female) authors-she’s-kept-on-her-shelves. I warn you, it’s long and may contribute to TBR pile overload. It’d be interesting sometime to see a similar list of the male authors on AKH’s shelves, but it’s a lot of trouble to create a real list with all the covers and everything, I know. I mean, you don’t see me doing it. AKH on DWJ You know you’ve arrived when your fans start referring to you by three initials because everyone knows who they mean, right? Andrea on Agatha Christie Which I know Flannery linked to in her post, but in case you missed it. I am not a huge Christie fan, but I added a couple of titles to my wishlist after reading through this post. There! I hope that will hold you all till tomorrow! Hey, people, I can’t tell you how happy I am that Ana and Thea of The Book Smugglers agreed to write a guest post for Andrea K Höst Week! For lots of reasons. Not only are The Book Smugglers one of the premier book blogger sites active today, not only do the eponymous Book Smugglers have excellent taste (eg, similar to mine) and thus direct me waaaay too often toward books I love that I might have missed, not only was Ana’s review of And All the Stars (along with Heidi’s at Bunbury in the Stacks) that first got me to buy AKH titles, but also the Book Smugglers’ joint review of The City in the Lake was really important to me. I mean, my first book! A review like that! You can imagine. So, I’m very glad to welcome Ana and Thea over for the day! Herewith their joint take on Touchstone Awesomeness. First and foremost, thanks for having us over for this wonderful event! Like most people here, we are huge fans of Andrea K. Höst – although our introduction to her work has been somewhat staggered and scattered. Ana was the first one to read Höst’s work, reviewing her fantasy novel Champion of the Rose, followed by SFF dystopian novel And All the Stars, and then – DUN DUN DUN – Stray (the first book in the Touchstone trilogy). Then, this past year while selecting books to read for our annual Smugglivus Feats of Strength, Ana dared Thea to *finally* try Höst’s work by reading Stray. And guess what? She loved it. The rest, as they say, is history. Shortly after Smugglivus concluded, we quickly decided that there was no reason for us to NOT read the rest of the Touchstone trilogy, which we accomplished in short order. And guess what else? With each further adventure of Cassandra’s we read (in Lab Rat One and Caszandra and The Gratuitous Epilogue), the more we fell head over heels in love with the series, and by extension Andrea K. Höst’s writing. Cassandra Devlin (Cass for short, never Cassie) leaves her final exams and somehow wanders through a rift in space to a place that she instinctively knows isn’t Earth. An abandoned alien world, Cass nearly dies of starvation and exposure until she’s scooped up by a humanoid group of elite soldiers, called the Setari. Cass is a “stray” – a wanderer between worlds – who cannot return home (it’s basically impossible without tearing huge apocalyptic holes in the fabric of the universe), and who is now a low-ranking citizen of Tare. Well, she’s low ranking and relatively unremarkable until it’s discovered that Cass possesses an unprecedented ability as a “touchstone.” That is, she can “charge” the telekinetic/psychic-gifted Setari (who are basically a police force that safeguards the universe from the threat of psychic ghost creatures), by enhancing their supernatural abilities. And… well, that’s just the tip of the psychic iceberg. There are abandoned planets uncovered, creepy clever spidery monsters, medical tests upon medical tests, copious amounts of danger, and an impressive dose of friendship and romance to boot. In other words: We Love This Series. And here are the reasons why. 1. It’s one of the best epistolary novels you’ll ever read because it makes sense within the framework of the world, and because heroine Cassandra is made of awesome. Cass’ journal is a daily log of her activities and experiences in this new world. It works very well because it is both an “after-the-fact” focused account and an extremely personal recounting of all sorts of things from the mundane to the life-altering. In simple words, the narrative is Cassandra’s as she relays events and facts and muses about them. Those musings are often passionate, many times self-deprecating and always, always interesting. Plus, the reason why the epistolary format works in a believable manner directly connects with the worldbuilding: every person on this planet is connected to the network via a nanotech brain implant that records, connects, transmits, even translates anything and everything. Because Cass can literally replay her day, log her memories, and recall them, it makes perfect sense that her diary is so detailed. This does not mean that her entries are completely reliable: there is the question of WHAT she chooses to relay and how. Many times, Cass understates life-threatening situations in ways that make them sounds like trips to the grocery shop when they are anything but. 2. Amazing Worldbuilding. Multi-dimensions, multiple planets, different strands of humanity, aliens, psychic abilities from minor telekinesis to the ability to shape reality, the importance of history to explain the present are all threads that are interwoven in this story. We’d say that the Touchstone trilogy is a bona fide Scifi Party. At its core though, the trilogy is a tale of survival: both personal, when it comes to Cass, and collective, when it comes to the Tarens and how they must strive to survive against enemies they don’t entirely understand. 3. It Raises Provocative Questions. About issues like privacy (or the lack of it), access and environmentalism (amongst many others). Primarily, there’s the question of privacy. Because Cass is such an important asset for the Tarens and the Setari, she is constantly monitored and her freedom to come and go, limited. She is often taken for tests, undergoes training to understand the extent of her powers and thus, it’s no wonder she feels like a lab rat for most of the story. Because everything that she does and says is a matter of public interest and public safety, her life in Taren is one of constant struggle for privacy (one of the reasons why her diary, written in English, is essential for Cass to maintain her sanity). Cass isn’t the only one who grapples with the interconnected nature of the Network and utter lack of privacy – the Setari are equally hounded by regular people and constantly monitored by their superiors. Television shows are made about their lives, and gossip speculation runs rampant. Access is an important thought here too, because Tarens have such exceptional technology – but are reluctant to share it with other human groupings of people in Tare’s local system. This is a pressure point for other cultures, especially when the (re)colonization of Muina begins. And, on the recolonization note, something Cass reflects upon frequently once Muina is being reclaimed by humanity is the Taren’s disregard for the outside world, natural wildlife and native ecosystems. It’s not a huge point in the book, but it’s a thought provoking one about the consequences of human civilization. 4. The Awesome Friendships and Secondary Characters. Cass is a bit of an outsider when she first arrives on Tare – being that she’s from a planet no one has ever heard of before and has an unprecedented psychokinetic gift – and she resents the never-ending training she’s subjected to with the Setari. That said, she quickly makes friends because she’s such a gregarious, genuinely open, and incredibly observant person. We LOVE the friendships she forms with other female characters (Tauriel and Zan in particular), just as we love the totally platonic relationships she has with male characters (especially Maze). There’s a heartwarming sense of camaraderie in this series – as there should be, given that these squads of people need to rely on each other to survive and do their jobs – and it’s so refreshing to read about these genuine, functional relationships. 5. The Romance. Because it’s a long slow burn, it evolves in a way that makes sense, and it’s SO GOOD, GUYS. We shall say no more: following Cass’ romantic journey as it happens is a huge part of why this trilogy is so, so delicious. So that is it in a nutshell! We hope you’ll share our love for Andrea K Höst’s Touchstone trilogy – please gush away and share your own reasons for loving this phenomenal series! Thank you, Thea and Ana! AND, YES, the in-depth and thoughtful exploration of privacy issues is unique in my experience, and Höst’s handling of this issue is indeed Made of Awesome. To me, that was not the single most enjoyable aspect of this story (that was Cassandra’s voice and the romance), but it was the most intellectually impressive aspect. Not to mention increasingly relevant to today’s society. b) your personally favorite aspect of The Touchstone Trilogy? Cass herself, the romance, the secondary characters, the worldbuilding, the technology, what? So much Awesome, so hard to choose. Wow, I’m glad I set Flannery’s post up in draft form last night, because quite a morning! Rush rush rush, I tell you, and I do get up really early, so that is not usually how my mornings go. But! All is well, because here we are, only a few hours later than I intended. Now, Flannery posts over at The Readventurer, and I’m glad to see that it looks like she’s going to start posting more regularly again. Plus, obviously, a guest post right here! Flannery is one of the original AKH fans PLUS you will notice she gets credited for AND ALL THE STARS, which I loved, so good job with that! So, welcome, Flannery! And I hope you’ll all enjoy reading her post as much as I did. When Rachel Neumeier asked if I would write a blog post about Andrea K. Höst for a dedicated week to the author, I quickly replied that I would. I am, after all, a gigantic fan of Andrea and her work. The problem with my snap decision is that I haven’t been participating much online lately, nor have I been writing (m)any blog posts or reviews. My fingers feel a bit rusty on the keys. However, if anything can divert me from watching John Mulaney’s New In Town on Netflix for the tenth time, it’s writing an entire post about what a badass I think Andrea is. Although she’d probably prefer not to fill this particular position, Höst is the self-published author against whom I compare all other self-published authors. She is absolute proof to me that an author can conceive of fantastic stories and characters, execute beautiful writing, edit, edit, edit, and deliver fully-formed books without the interference of a third-party publisher. Of course, I am not deluded enough to think there are no third-party interveners from when she writes the first draft until she puts it up online, but she is the end-all in terms of all aspects of the books. At the time I originally wrote my review, I thought that Stray needed to be edited down a bit because there was just so much going on. After reading two more of her books, I think the amount of ideas that must be in Andrea’s head is insane. Some authors take years to develop worlds as complicated and intricate as the ones she imagines up. There is a lot of description, but not in a Tolkeinesque let’s-describe-each-rock-the-gang-encounters type of way, more in an I’m-excited-about-what-I’m-writing-and-can-visualize-every-inch-of-this-world kind of way. Not description of random pieces of nature, but instead description of underlying systems and worldbuilding, which doesn’t always work for me as a reader but totally works for me in terms of Andrea’s writing. In a total reverse from what usually happens, I think I enjoy her books even more as time passes. Though I have so much respect for Andrea as a writer, I think my positive feelings arise equally from the way she presents herself online. She blogs about her writing, tweets about her interests, and participates often as a reader. (something I know Neumeier also does well) She wrote a two-part primer on Agatha Christie and similar mystery authors for my blog that still gets lots of traffic to this day. After my friend and I read Stray, we chatted off the record and on the record (well, on Goodreads) about how we would absolutely love it if Andrea wrote a survivalist story, and the craziest thing happened. Höst somehow took the wishes and dreams of some random people on the internet as inspiration and turned them into And All the Stars. In less than a year. If you look at WorldCat for And All the Stars, it looks like there are eleven US libraries that have at least one copy in circulation. For a self-published author, I think that’s amazing. Of course, many libraries can’t afford to keep books on their shelves if they aren’t routinely checked out, but I periodically keep tabs on them when I am placing holds and there are usually one or two of her books checked out. 4. The Australian outback as a setting. I lied. I could only think of 6 things off the top of my head. If you could go ahead and take one of those tidbits and change it completely into something amazing and yours, that would be great, m’kay? Thanks, Flannery! And if I get to vote, I totally vote for a convoluted prison breakout. That is a trope that really works for me. Can we get everybody else on board and put some pressure on AKH for that one? Because I’m sure she doesn’t have anything like enough ideas to work on already, right? I was going to put in another guest post today, but actually (clears throat) I only just finished *my* post for this week, making me the very last person to meet this particular deadline. And then my post proved to be too long. So I have revised it into two posts, of which this is the first. So! A guest post again tomorrow. But here is the first of two from me, and if the week stretches out a trifle, fine. For me, the first book of this duology was fine, but I preferred the second. I enjoyed the set-up of the situation with the Champion, though – I mean, how would you like to be chosen as the King’s Champion almost literally because of your pretty face? Against not only your wishes, but also the king’s, because it’s a kind of curse type of thing that does the choosing and there’s nothing either of you can do about it? I like how determined Soren is to really BE the King’s Champion, despite her fury as she figures out how the curse has worked. I like how Strake is determined to be the best king possible, despite circumstances that are really just beyond difficult. Darest is quite a country for curses. It’s the Fair, really. I can’t say I would want those people for neighbors personally. Though the Rose, no. The Kings of Darest did that one to themselves. Quite a problem for Soren and Strake when a magical thing that was supposed to protect Darest takes on the wrong kind of life of its own. But the thing is, my favorite character from the first book is actually Aristide Couerveur. I love the situation he’s in, and how he deals with it, and keeps on dealing with it because it’s not the kind of situation that actually has an end. And Aristide Couerveur doesn’t get to be a main character till the second book. 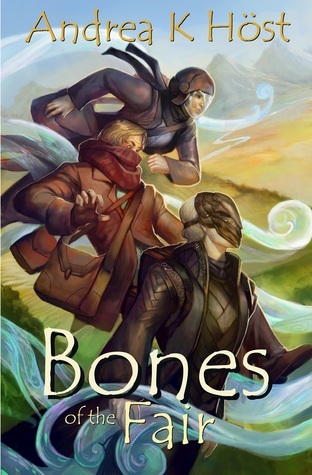 Yeah, the second book: Bones of the Fair, which just came out last year. For me, that’s the one which is the must-read. In Bones of the Fair, Gentian Calder is in a difficult position. She has been in self-imposed exile for years, but longs to return home. But when she’s home – when she’s anywhere in her home country of Darest – she wakes up every single morning at dawn in the grip of a terrible nightmare. If she tries to stay awake through that moment, she’s first compelled asleep and then blasted out of slumber by this nightmare. She’s suffered this curse since birth. Even so, she’s determined enough that she’s come home anyway, drawn by a hope that now, following the events in Champion of the Rose, things might be different. She was wrong. The curse is still right there. Aristide Couerveur is in a difficult position. He always knew he would eventually rule Darest – until suddenly, against all possible expectation, the true king returned (in Champion of the Rose). Now he knows he will never rule, because rebellion against the rightful king would tear his country apart. He can’t do that. Instead, he’s determined to do everything he can to make sure Darest prospers. This will be tough, since the country is actually still under a curse. Or maybe two curses. I did say this was a bad country for curses, didn’t I? Half of Darest’s neighboring countries have suddenly found themselves in a difficult position. Their various rulers aren’t necessarily eager to explain to the king of Darest just what all their heirs were finding to talk about while they all attended a little boating party right at the border of Darest. But certainly none of them expected all those heirs to suddenly vanish, caught up in a strange and terrible curse that may be just about to reach out from the past and shatter Darest. Okay, so, read the book, right? Start with Champion of the Rose, sure, but even though it’s self-contained, definitely continue with Bones of the Fair. Aristide Couerveur is, as I said, my favorite character from this duology. I could talk about him all day. But not just yet. Instead, I will bring him up again, later in the week, in a post on the heroic tradition in Andrea K Höst’s fiction. Here we have a guest post from Chachic, of Chachic’s Book Nook! I must say, I had no idea that Chachic only started reading romances last year. I would definitely not have guessed that, since she’s the one who got me started reading more romances! But I’m not surprised to see that’s the focus of her guest post today. Lots of romance-y goodness in Andrea Höst’s stories. So, welcome, Chachic! Yay for Andrea K. Höst week! I’m honored that Rachel invited me to take part in this. I’m more than happy to contribute a guest post because I really think more readers should pick up Andrea’s novels. There are many reasons why I would recommend her books but one of the aspects that I love about them is the romance. While I’m fairly new to the romance genre (I only started actively reading romance books last year), I have always loved well-written romances in my speculative fiction reads. Andrea has a knack for writing wonderful romances that I can totally root for. What usually works for me is slow burn romance between two characters who are very reluctant to admit that they’re attracted to the other person – it may be because they feel that they’re not ready for a relationship or they feel that there will be a lot of difficulties involved in pursuing the object of their affection. The tension between them simmers and builds until they have to acknowledge what’s between them. Even better if one of them is a stoic and unreadable character, barely giving hints that the attraction will be reciprocated. I don’t mind if it’s obvious from the start who the main character’s romantic interest is, just as long as they don’t get together in the blink of an eye. I had a book hangover after finishing both the Touchstone trilogy and the Medair duology because I couldn’t stop thinking about the events in them, including the romantic elements within. I love how she manages to surprise me with the twists and turns in her writing. I have given up trying to predict the direction her stories will go and I’m perfectly willing to just sit back and enjoy the ride. Aside from the non-instalove quality, what appeals to me about Andrea’s romances is the type of main characters that her novels have. Her MCs are always smart, strong and capable young women who eventually meet men who recognize their positive attributes and grow to admire them. These men are equally capable and are worthy of being admired in return. Working on this guest post is making me want to reread Andrea’s novels. Maybe I should give in to the temptation and indulge, I’m pretty sure I will enjoy reading them just as much (if not more) than the first time I picked them up. If you haven’t read any of Andrea’s books, now is the perfect time to do so! Thank you, Chachic! I totally agree; Andrea is VERY likely to take her readers off in a completely unexpected direction halfway through a book. Especially with AND ALL THE STARS and the MEDAIR duology, I had to re-read them just to look for hints of what was coming! Thanks to Estara, we have a pointer to the gif version of STRAY! You will need to scroll waaaay down to get to the beginning if you want to start at the beginning and work your way up. The last journal entries are from Feb 6 (Cassandra’s time), whereas you recall (no doubt) that she walked through the portal on November 16th. I am not real familiar with Tumblr because I have enough hobbies thankyouverymuch, plus multiple jobs if you include the book I am supposed to be working on right now. No doubt lots of you will have less trouble getting back to the very beginning of survivorcass.tumblr.com, but it’s well worth the trouble either way. All the quotes are from the book and all the visuals are SO MUCH FUN. This is a real labor of love. Check it out. Okay! As you know, people, Andrea K Höst Week is starting tomorrow, right here, so you will want to remember to check back in! At this very moment I have all the guest posts in my hands, well, all but one, and I am PROMISED that one is ON ITS WAY. We will have a wide variety of guests making an appearance: fans, bloggers, and authors, a nice eclectic mix. I am not going to give you a schedule of guest appearances, though, because a) it turns out I am not that organized and have not worked out an order yet; and b) I do not want all the Touchstone Awesomeness posts to appear one after the next, so I may need to shuffle the order around a bit at the last minute anyway. I can certainly tell you, though, that I will be posting myself once or twice on this and that, and that Sherwood Smith’s post will go up at the end, on the 24th, a date she requested for good and sufficient reason, so you can look forward to that to wind up the week. Also! You will certainly recall that at the end of the week — meaning on the 24th or very soon after that — I will be picking the name of one commenter from the week out of a metaphorical hat. That lucky person will receive the Andrea K Höst title of their choice, either physical or e-copy, whichever they prefer. If your memory is good, you may remember that I said earlier that if you already had all of Höst’s titles, you could request something by a different author; but to simplify my life I have unilaterally changed my mind about that. Instead, if you already have all of Höst’s currently available titles, you can either request another (to give away), or request one of her forthcoming titles, which I will send you when it becomes available. This promise is now set in stone and I won’t change my mind again, really. Okay, onward! Time to go decide for sure what I should post tomorrow!